Create, send, and track professional, eye-catching email campaigns that reach customers and prospects with the right message at the right time — all from within Act!. Powerful, easy-to-use emarketing tools help you reach the right customers and prospects with the right message, so you can grow your business, drive sales success, and create customers for life. Create and send campaigns, analyze results and insights, and view comprehensive contact history — all within Act! Take notes, view complete history, and edit contact details to keep your data up-to-date — no synching, uploading, or downloading needed. Easily create simple webforms to capture leads from web pages, newsletters, emails, and more! Copy/Paste HTML into your web page, newsletter, and more - or, use a hyperlink to our hosted form. Extended and basic forms available. Easily keep your leads organized with Act! Group functionality. Send personalized emails immediately or schedule for future delivery with ease. Graphical reports give you valuable information at a glance — including opens, clicks, and bounces — to measure the effectiveness of your emails and better understand your recipients. Find out exactly what happened after your email was sent, including open rates, clicks, bounces, opt-outs, and more in easy-to-analyze graphs and detailed reports. Use learnings to continuously hone your messages. These results can also be recorded in Act! history so you can make sure future communications reach the right people. 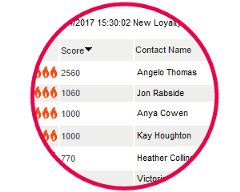 View a prioritized list of recipients ranked by level of interaction — allowing you to contact those who are most interested in your message — right within Act!. Robust integration within Act! 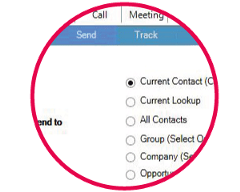 allows you to easily create Histories, Activities, Lookups, and more — right from the contact within the Call List. It's simple and economical to create professional looking emails with our unparalleled drag-and-drop template editor. 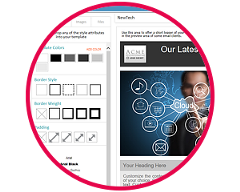 Design your own or customize one of our 100+ provided templates to send the perfect email campaign. With over 100 email templates provided, you're sure to find one that fits your business need, or easily import your own HTML files for a completely custom campaign. Customizing your email template is simple with our intuitive template editor. Included with your Act! purchase. User/month (billed annually) Requires an active Act! Premium subscription.